La Madeleine cultivates its French focus during Bastille Day and other celebrations. 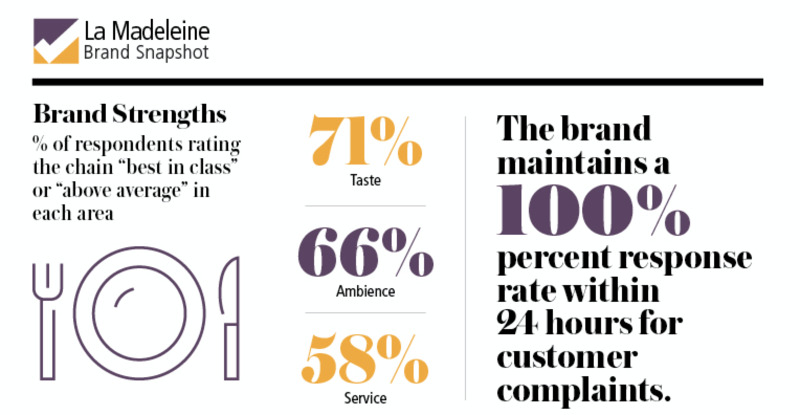 It’s no fluke that La Madeleine French Bakery & Café earns high scores when it comes to consumer loyalty. The 87-unit chain based in Dallas has been focused on that for the past couple of years, especially in the digital space, according to president and chief operating officer John Cahill. The result has been striking. This past year, the number of digital users has increased by more than 20 percent over the previous year, and transactions are up by more than 33 percent, he said. That’s partly due to a focus on guest relations, including a 100-percent response rate, within 24 hours, for customers who have an issue with their experience, whether they contact the chain via email, social media, telephone, on La Madeleine’s app or elsewhere online. During office hours, Cahill said they strive to respond within one hour of the complaint. 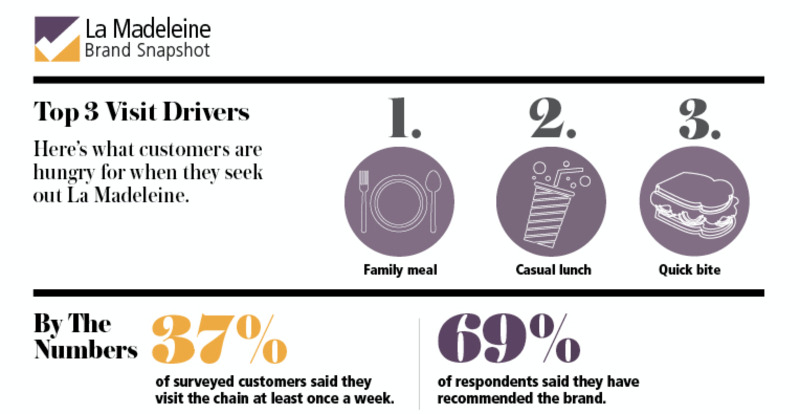 The chain, which also scores well in ambience, is a popular venue for casual lunches and for hanging with friends, as well as for quick bites and family meals, according to Consumer Picks data. Its food scores well particularly when it comes to soups and sides. Cahill said La Madeleine reaches out to customers on a monthly basis for systemwide celebrations, sometimes fitting the chain’s French theme, such as its July Bastille Day celebrations or Croissant Day in January, and sometimes less so, such as its February 13 Galentines Day promotion that encourages women to take out other women. Using the data gathered through its loyalty program, La Madeleine has started to gain a better understanding of its individual customers — whether they have kids, if they cater, if they like to order ahead, etc. That in turn allows them to target their marketing, offering special promotions for kids’ meals, for example, or inviting guests who have never come in for dinner to try it.